Get involved... and get a free t-shirt! If you're looking for an opportunity to serve in a similar way as I did this summer in Kenya, check this out! This is more for those of you who are already in the medical field as opposed to those of you, who like me, are still in school. But it's still worth a look! AND... if you share this link either on facebook, twitter, or blog, you can be entered to win a free t-shirt! So, share with your friends! The right person for the job may be in your network! It's been quit a while since I last posted, but I've been debating with myself about whether or not I should continue the blog now that my trip has come to an end. I've posted some of my stories of my adventures and the people I met; the good, the bad and the ugly. Now that I'm not only back in the States, but back at school, I tend to think that nothing could ever compare to what I saw and experienced during my time in Kenya. But that is so far from the truth! So, I want to continue sharing stories of people I meet and experiences I have that have burden my heart. I wanted to update you on my earlier post about James and Jeremiah. Unfortunately, I have some very sad news. Remember James? James was sent to Kijabe Hospital for treatment because CURE didn't have the resources to treat his bed sores. His family was unable to afford the treatment, and last Wednesday (4th of July), James passed away due to infection. Thank you to all of you who prayed for James. I know that God is using his story to change the lives of many people. I know he has touched my heart and the hearts of those who saw him at CURE. Join me in praying for people in Kenya who can't afford medical treatment! ... And he started physical therapy! He has good range of motion, but he has no feeling in any of his fingers. Mirriam would move his hand and fingers in every direction, and he couldn't feel any pressure on the skin that I thought looked like it should be tender. But praise God that he has had a good recovery so far and he is able to move his hand! Jeremiah and his dad loved playing soccer around the hospital and he is a really happy kid. Since I last posted I had to say goodbye to some pretty awesome people and traveled a little less than half way around the world! I've been home for a few days now and I have to say that the past 7 weeks just feel like a big blur. I was looking through my pictures and just thinking, "Wow, I did that!" When I was there it felt normal to walk into surgery if there was nothing else to do, be sent out to see a patient needing a wheelchair if there was no one else available, and see a baboon along the way. As I'm here sitting in my house, looking out at the cornfield in my backyard, and drinking my cup of coffee it all seems like a dream. I don't want to go back to my everyday life in America. I don't want forget what I saw and did in Kenya. I want my life to be transformed! There are still families that can't afford medical care, and the little boy James with the bed sores still hasn't been treated. I hope that all of you reading my blog have been able to see some of what I had the privilege to see and want to do something as well. There are tons of ways to support CURE and the work they're doing. I named my blog "Won't Turn Back" after the song by NEEDTOBREATH. It was scary to answer my call to Kenya with no idea what was in store. It's still scary now that I'm home to take on the responsibility of sharing my experiences and telling everyone about the need I saw. But God gives me the same strength He gave Christ. So, I won't turn back. Where have the last 2 months gone? Tonight I leave Kenya for the long journey back home after an incredible adventure abroad. It's definitely a bitter sweet feeling and I will be so happy when the goodbyes are over and my flights arrive safe and sound. Saying goodbye to the wonderful people here is the hardest part about leaving Kenya, but I do it with the hope that God will provide a way for me to return in the future. Thinking about all the joys of summer time in Jersey and the comforts of home excite me, but the thoughts of leaving some wonderful people and a country that I love behind breaks my heart. I'm sure going to miss this place. 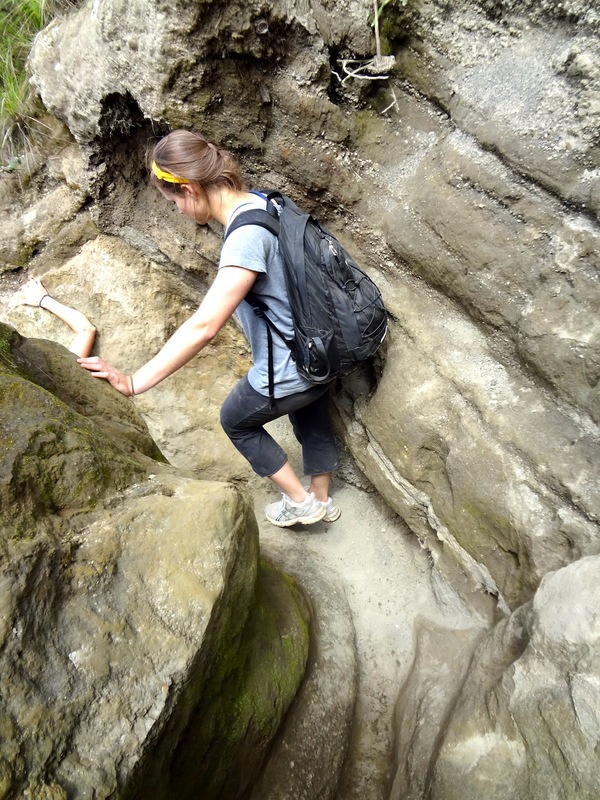 But what a better way to end our trip than hiking Mt. Longonot with some of the hospital staff! It took us about 4.5 hours to finish the whole thing, and afterward Haley and I taught the Kenyans how to play ninja. Lets just say they loved it! Then they took us for some nyoma choma (aka grilled goat). I've had grilled goat before, but this did not taste good. It was good company as always though. As my time in Kenya comes to an end I've been trying to get as much in as possible and cherish every moment. Monday I saw some more surgeries and hung out with the CURE doctors and residents. Tuesday I visited Bethany Kids, which is basically a wing of Kijabe Hospital that focuses on children with neurological problems like hydrocephalis and spina bifida. This kid with hydracephalis was having the fluid drained out of his head. The yellow stuff in the tube is his cerebral spinal fluid! I had met James, the Bethany Kids physical therapist just that morning and he was more than willing to show me around the ward. It was so different from the CURE hospital! Every bed was full and patients were lined up all along the hallways. I saw some adorable children, and the mom of this little boy told me I could take him home. I almost did! While I was in the ward at Bethany I heard nurses calling for help and I saw them rushing a little kid with hydrocephalis into a private room. It wasn't until I saw the mother of the child on the floor crying hysterically that I knew something was terribly wrong. I left the ward before I could find out what was happening, but I was crushed seeing that mother helplessly calling out to her baby. CURE specializes in orthopedic cases so all of our patients are relatively healthy besides their deformity. The biggest emergency we see is a chest infection after a spine surgery. That was definitely something I wasn't ready to see. On Tuesday I also went to my first rugby game! RVA played a Kenyan team for the semifinals, and unfortunatley they lost. I had no idea what was going on, but I can definitely say that it's an intense sport. Wednesday was a clinic day, so I followed around some doctors and saw some patients. We got done early, so I went up to the PT department to talk to Mirriam and Elvis. I just love them. Elvis thinks everything I say hilarious and his laugh is super contageous, so I feel like we're always laughing. For some reason the topic of peanut butter came up (probably because I eat it for almost every meal here in Kenya) and Mirriam had no idea what it was. I had to explain to her what peanut butter is made of and what it tastes like. Needless to say, I bought her some peanut butter. I'll definitely miss them when I have to leave. Thursday was really slow because a cleft lip and palate clinic is coming in next week and they want to have the ward empty for those patients. We had 4 patients left in the ward and only one CP patient (out of the 3 that were supposed to show up). Today we had the clubfoot clinic. Mirriam left for her home village today so it was just me, Elvis, and David. I did a lot of casting and watched a few tenotomies (cutting of the Achillies tendon to release stiffness). This afternoon we had a going away party for the Executive Director, Jack, as he moves to another job in Nairobi. 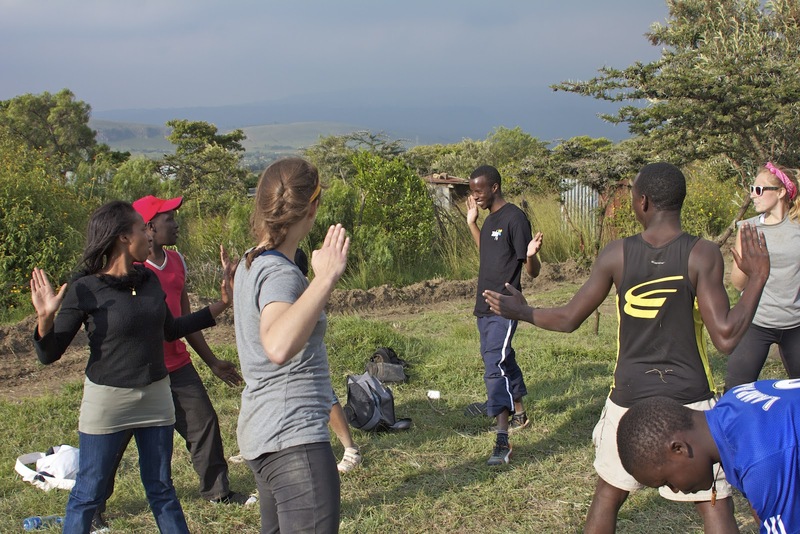 We did this Kikuyu tribal dance around the hospital in honor of Jack, and it was SO much fun. We were cracking up the whole time. I wish I had a video. It was bitter sweet though because I had to start saying my goodbyes. I'm not looking forward to saying goodbye to everyone on Monday, but it will be exciting to be home after 7 weeks away. I've been realizing how many people I've gotten the opportunity to meet and grow close to in my short time in Kenya and I think I'll realize it even more after I'm gone. It's crazy how eager I am to be back in the US, but at the same time so sad to leave. Kijabe has started to feel like home in a way and I can't imagine not going to work in the hospital everyday, walking to the dukas for food, and coming home to Kenyan John building us a fire and doing homework in the kitchen while we check facebook and write our blogs. I'm glad I still have the weekend to live it up and take it in! 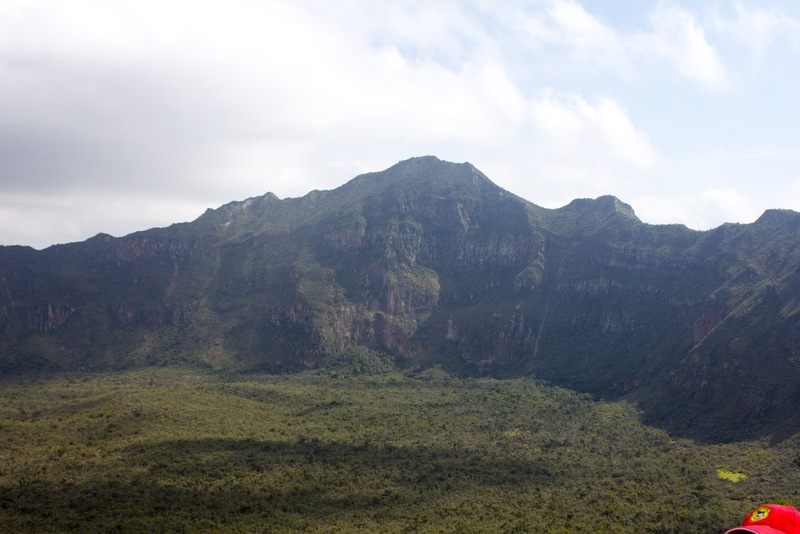 Tomorrow we hike Mt. 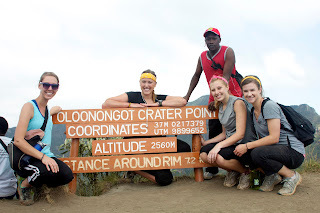 Longonot :) I've been so blessed, and all the glory goes to God. Now, I can't post without showing some pictures of the kids in the ward this week. So here they are! I only have one more week at CURE, and I feel like I still have so much more to learn. 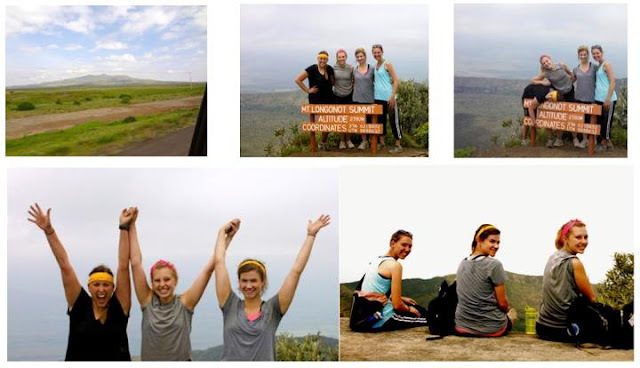 Something I have learned is that Kenya is very laid back, and sometimes disorganized. 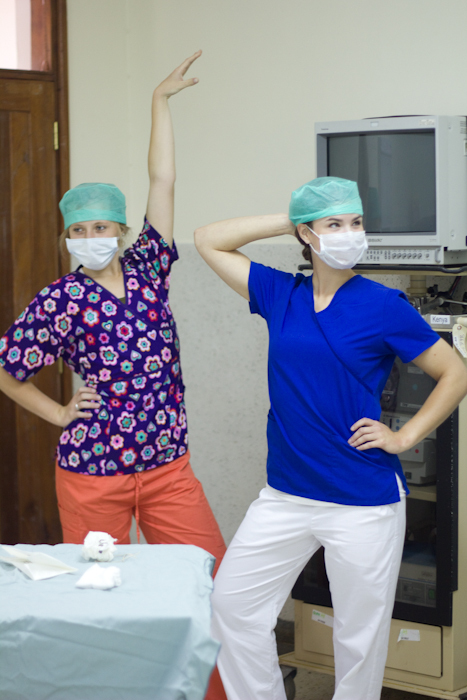 What hospital in the US would let undergrad students just sit in on a surgery? And let me scrub in? The hospital is very relaxed because that's how the Kenyan culture is. We have cerebral palsy patients come in on days that we don't have clinics, so those days are the most random schedules ever. In Kenya, they don't make appointments to see the physical therapist. They will be told to come back in a week, so sometimes they do and sometimes they don't. Some days well be sitting in the rehab room and Mirriam will be checking email while I just sit around. I'll ask if we have any more patients for the day and most of the time she'll say, "I don't think so," or "we should have 2 more but since it's after lunch they probably won't come." It kind of drives me crazy, but it's totally normal in Kenyan culture. A lot of our patients come from far away and they have to wait until they have the money for transportation to come to the hospital. So appointments just don't really work here. Kenyan culture is also very relaxed when it comes to privacy; At least when it comes to who is in the room while a patient is being seen. CURE's rehab room is literally about the size of my dorm room at Asbury. That doesn't stop them from putting up to 3 families in here waiting to be seen. Like I said, no privacy. And it's not unusual for the therapists to answer their phone in the middle of an appointment and have a full out conversation in front of the patients. I can't help but laugh every time it happens. In America you just wouldn't even think about answering your phone when your with a patient. But like I said, Kenyan culture is very relaxed and I don't think that's changing anytime soon. Kenyans will be Kenyans. Although I tend to get frustrated with the disorganization in the hospital, I love how easy going and loving everyone is. I feel like I can ask to do anything and they will let me try (within reason of course). Right now for example, I am sitting in the OR waiting to see a surgery because we don't have any patients in physical therapy. It's only because of their laid back attitude that I can have most of the experiences that I've been having here in Kenya. My slightly type A personality wants to schedule my whole time here, but what would be the fun in that? CURE International genuinely loves the children they treat and they will do everything in their power to make sure their patients get the best care available. I hope that wherever I end up one day that I can bring this same attitude. CURE is holding a 1 Child Challenge, and it's so easy I had to share. How do you take the 1 Child Challenge? 3. Click Follow on the right hand side toolbar of that child's page. 5. Share the child's story on Facebook, Twitter, etc. 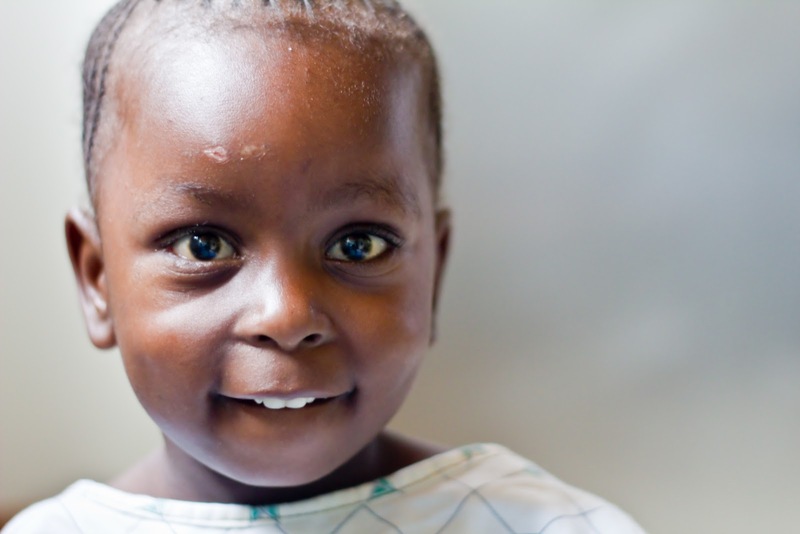 As a result, one of CURE's donors will give $1 towards that child's care. You don't pay anything! Yes, it's FREE! So why not do it?? 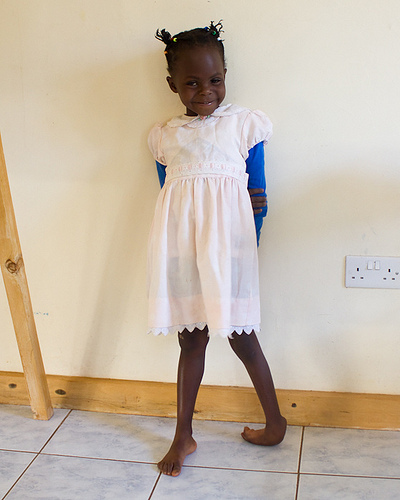 A few weeks ago I sat in on her PMR surgery (posterior medial release) to straighten her clubfoot. Now she's home and hopefully recovering well. You can follow any story, but if your interested in following some kids I've met here in Kenya you can choose one of these! * WARNING: Some of the pictures in this post are very graphic. If you don't think you can handle it, scroll quickly through. I've seen some great things in Kenya, but I've also seen some really terrible things. Working in a mission hospital has shown me just how desperate the people of Africa are for good health care. The problem is that good health care isn't free. CURE International is a wonderful organization that provides free surgeries for children with disabilities with the help of generous donors. Unfortunately we can't give all of our treatments for free. He fell from a tree in February and was sent to a local hospital for treatment. He was admitted, but he sat in the hospital for over a month without seeing a doctor because his family couldn't afford the fees. He finally left the hospital and was forced to lay in bed at home without anyone attending to him. He came to CURE in search of a wheelchair because he had lost all feeling and function of his legs. When Charmi and I first saw him, his father explained that he had sores, so as is protocol for distributing a wheelchair, we had to take a look. I was definitely not prepared for the severity of his sores. You can literally see the femoral head and his gluts. I have never seen anything so terrible in my life. James has no sensation in his legs due to his injury and lack of treatment, so when he lays in bed 24/7 without being moved, this is the result. As you can see, his condition is critical, and it's been much much worse than it would be if he had seen help initially. He may actually have function of his legs if he would have been able to afford treatment from the hospital he went to first, and in turn he wouldn't have the pressure sores. Because CURE Kenya specializes in orthopedics, we don't have the doctors to treat James. He needed to see a plastic surgeon immediately so that the wounds wouldn't become infected, but that means that all we can do is refer them to Kijabe Hospital. James and his family couldn't afford to go to Kijabe Hospital, so they ended up just going home. This is just one of the sad stories that are a reality everyday in Africa. The health care is here, but for some it is impossible to acquire. James will probably not survive infection if the wounds get to that point. It's frustrating because I want to do something, but sometimes you just can't. Jeremiah has a similar story. 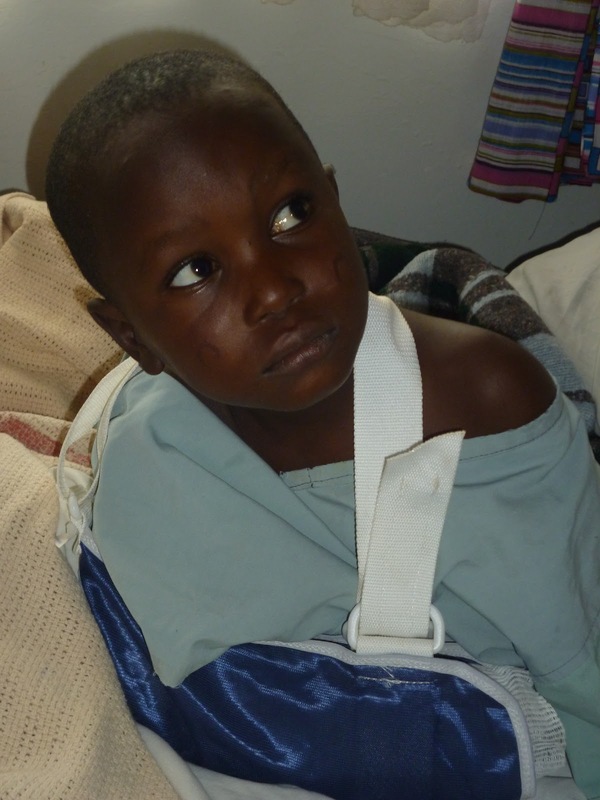 He broke his wrist about 3 weeks ago and soon after went to a traditional doctor near his village. 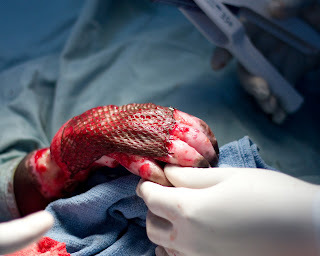 They splinted it, but they ended up creating a tourniquet type of device that cut off all circulation to his hand. As a result, the skin covering his hand died and pealed away leaving just muscle and bone. His finger tips were gangrene, but the good news is that his bone has healed! The wonderful doctors here at CURE were able to do a minor skin graft to prevent infection, but they still don't know how much function he will have in his hand. So you may be feeling some of my frustration. I want the best for these patients and so does the staff. Elvis worked so hard to find a solution for James, but there just wasn't anything we could do. I just can't stand the fact that he just went home in the same condition that we saw him. Right now, I feel like all I can do is pray and hope that God can provide a way for these people with little money to be healed. 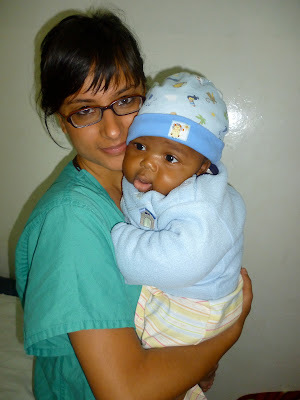 Please join me in praying for these people and the Kenyan health care system! On a lighter note... Mirriam had Charmi and I over to her house for dinner on Tuesday. She taught us how to make chapatti! Mirriam is seriously the best! And I am definitely making chapatti at home. This weekend was very eventful to say the least! We left Thursday afternoon to head into Nairobi, where we met our bus that would take us 10 hours to Jinja, Uganda. After dealing with having to cross the boarder at 4am and not sleeping hardly at all, we arrived safe and sound at a gas station on the side of the road. Thankfully, among the hoard of boda boda's (same as Kenyan piki's) that wanted to drive us to our destination was a nice man named Simon who called a taxi that would take us to the resort. This resort turned out to be more like a backpacker's hostile, but it was great none the less! After getting checked in, we took some boda boda's into town to get some pizza and coffee. We had some wonderful pizza at a place called Surgio's which is owned by an Italian family. It was SO good! Then we went to The Source for some coffee and internet. We met up with Jake, a guy we met at the hostile who was meeting up with some street boys. He bought them all drinks and we sat around the table sharing the gospel. It was powerful to hear the questions and doubts these young boys had and how much they longed for something more. They all ran away from their homes, and are now living on the streets of Jinja. They said that they beg for food all day, and if they don't find food, they eat dirt. One boy was carrying a sheet that he used to sleep on, but the other boys had nothing. None of them wanted the life that home offered, so they choose this life of living on the streets. The saddest part is that they feel betrayed by God for letting their lives end up like this. We prayed over them, and Jake took them to the market for some shopping. It was great to see God working in a place we totally weren't expecting. Coffee at The Source with the street boys and Jake. After seeing Jinja we headed back to our rooms to get ready for the night cruise on the Nile. I have to say it was a little disappointed cause it was kind of short and the clouds covered the sunset, but we met some great people! I feel like we have been so blessed to come across people from all over the world with amazing stories and very interesting backgrounds. A guy we met earlier that morning at the hostile was on the cruise with us. He evidently produced this video of a group of orphan boys that he works with re-creating the 1986 World Series game where Bill Buckner's error led to the Mets winning the series. He basically was freaking out because he was "becoming a celebrity over night." I don't know if anyone actually saw it on ESPN, and if you did please let me know! We would get a laugh out of it for sure. Here's the video. Saturday was our big rafting day! We left early in the morning to gear up and head out. 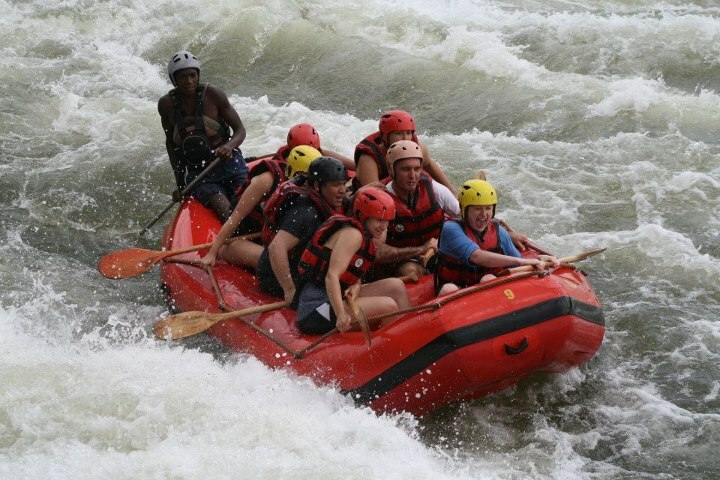 I'm the only one of the four of us girls that had ever been rafting before, so we decided to try to take it easy. The only other people that didn't want to go full out were a big Venezuelan man named Antonio, a sweet Irish girl named Gi, and a story telling South African named Kevin. It was an interesting group. I was a little worried in the beginning when our guide Henry asked if everyone could swim and Antonio and Gi both said no. We had so much fun though! After the first grade 5 rapid, we were all ready to hit the water hard! We ended up not flipping at all, but it was an exciting day for sure! After rafting and dinner we headed back to the hostile to wait for our bus back to Kenya. We met Wil and Ben from California who were also waiting for a bus. It was exhausting, but SO worth it! I loved Uganda and all the people I got to meet. Now we're back in the hospital for two weeks. It's crazy to think I'll be home in 15 days!